Proof of tenant's past residency in U.K.
Tenant reference from a previous landlord if applicable. Collect copies of I.D. and other documentation for tenant's reference. Our standard Assured Shorthold Tenancy Agreement is drawn up for you and then emailed to your prospective tenant to sign along with instructions to pay the first month’s rent and Tenancy Deposit. Landlord Direct, are the ideal letting partner for private landlords, and our experienced staff are here to properly process the screening of your potential tenants. Landlords in this day and age should not cut corners when it comes to checking out their potential tenants. There are some online websites out there that try to offer totally automated referencing services, but this quite frankly does not work, inevitably our staff have to chase up references, and documentation, real people, hard work, you cannot beat it ! With the Immigration Act in force 2015, Landlords now have a legal obligation to carry out proper checks on their prospective tenants. Carrying out a tenant credit check is a huge part of the tenant reference service carried out by Landlord Direct and will provide a lot of valuable information to consider when choosing which tenant is right for your property. The fact that you can credit check tenants online with ease and get instant results makes life as a landlord or property agent so much easier. Tenant credit screening is a good way to check that your tenant is financially responsible and not in huge debt which means they will have trouble paying you each month. It is a well used tool in many industries to evaluate the possible risk of lending money to someone. Although renting is not really lending money, you commit to monthly payments which must be met so tenant credit screening can help reduce the risk. A rent credit check uncovers a lot about a tenant's financial history which can assist you in deciding on which tenant to take. A tenant's credit check will highlight a few key points to consider. It will show you if a tenant has any CCJ's (County Court Judgements), Insolvencies or bankruptcies; if they are on the electoral register and if they have any undisclosed addresses. It will also provide a credit score with recommendations on how to proceed with that particular tenant. 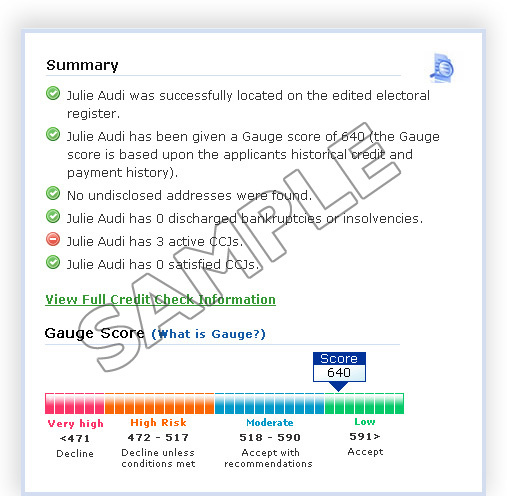 The tenant credit screening take a few seconds to see results with all the information displayed in an easy format. You can even download the report into PDF form. Landlord Direct, check the electoral roll to check the prospective tenants past address' over the last 3 years. Landlord Direct often call for supporting documentation, examples being copies of passports, Visas, driving licences, bank statements as required. A conditional offer of a tenancy is set up with the tenant subject to tenants / guarantors providing actual documents at sign up, so landlords can completely satisfy themselves on the tenants identification. Discovering more about your tenants employment can give you piece of mind that your tenant is in employment and is employed in the job they have told you. When you first register your potential tenant's interest in your rental property, you will have taken all their personal details, previous landlord details and employment information. Finding out a tenant's salary will allow you to calculate how much of their monthly salary will go towards rent and if the rental is a realistic and affordable venture. The employer reference check will allow you to confirm that the salary stated by the potential tenant is correct so real projections of affordability can be made. The employer reference for landlords will also ease the mind that the tenant is in employment on the basis stated. For instance, a tenant may claim to be in full-time work, when in fact they are on contract work which is not permanent making any rental payment after the conclusion of that contract unaffordable. The employer reference is more about confirming the financial stability and future of your tenant. If all looks good and the employer can confirm that the tenant works for them and is paid the salary they stated then you can relax knowing that rent won't be problem. Landlord Direct chase an employer reference . Employers are of course busy, so Landlord Direct staff email their requests and follow up by telephone. Landlord Direct send an email to the tenant's previous Landlord asking them to fill out a short form verifying details such as rental dates, whether the tenant paid on time and if they looked after the property.